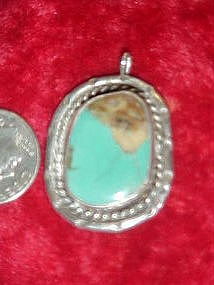 Vintage sterling silver pendant has a large turquoise stone with a rope twist embellishment. Southwestern Indian made. Measures 7/8" x 2 1/4". No chain included with this one. Very pretty!